When I first started baking, I followed every recipe exactly...most breads and all cookies/muffins/etc relying exclusively on unbleached all-purpose flour. Some of my bread recipes during my various challenges called for other types: whole wheat, rye, pumpernickel, corn. My cabinets filled with different types of flour, but it was still the all-purpose that we purchased in twenty pound sacks and cycled through at unbelievable speed. Eventually I heard enough/read enough to realize the benefits of whole grain and, following many recommendations, I started subbing in whole wheat - and then white whole wheat - for a quarter of my all-purpose flour. Gradually I started adding more and more, until finally, with this unprocessed challenge, I wondered, "What would happen if I used all white whole wheat...would anyone even notice?" The simple answer is: No. Burger buns: I used KAF's best beautiful buns, but subbed in 400 g white whole wheat and 20 g vital wheat gluten. Made twice - gorgeous, fluffy, buttery buns both times. Crackers: I used this buttermilk whole grain cracker recipe, subbing in a combination of white whole wheat and ground flax seeds. Yum! Muffins: I've been subbing in increasing amounts of white whole wheat flour for the all-purpose in our muffins: garden harvest, banana chocolate chip. Scones, too, starting with Smitten Kitchen whole wheat berry scones. Sometimes I put in a scoopful of all-purpose, but the majority is always white whole wheat. Everyone gobbles them up just as quickly as before. Pizza crust: I tried my first 100% whole wheat pizza crust this past week, and it was amazingly delicious. I used this recipe from KAF, omitting the sunflower seeds. Spaghetti noodles: I've already written about these; we love them! Tortillas: My biggest unprocessed/whole wheat success story may be these tortillas. We've had them with fajitas three times in the past two weeks, and they are so good. The kids aren't big fans, but they've tried them every time, in the hopes that eventually the taste will become more acceptable. Hubby and I love them, though, and I am getting so much better at making them. Last time, it took me only 20 minutes to roll and cook the whole batch! 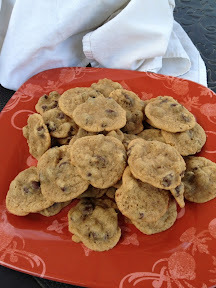 Cookies: While this unprocessed challenge has helped us cut down on sweets a lot, every once in a while you need a little something, and I was intrigued by these 100% whole wheat chocolate chip cookies from KAF. It's true that they have a fair amount of processed sugars, but we tried them anyway. The little girl and I had fun baking them together this afternoon. We made tiny teaspoon-sized cookies, which baked perfectly in eight minutes, and hit the spot as a little after-dinner treat! I've been subbing www in recipes quite a bit, too, though I don't think I've done any that are 100% ww yet. Being in Texas, we get very good tortillas made by our grocery stores (minimal ingredient list). I've bought the whole wheat ones ever since I had the girls. What's funny is that neither one of them will eat regular flour tortillas now. =) They also think all quesadillas should come with refried beans inside as well as cheese, since that's how I've made them since they were little (attempting to get more protein into their diets). The biggest unprocessed challenge: Snack time!